This photo was sort of an accident. I was trying to photograph some oven fries and got completely frustrated. I gave up on them. I didn’t like my perspective. I didn’t like the light. And I didn’t like how much my stomach was growling. So I climbed off my chair and headed inside to grab a potholder. As I glanced back at the tray I saw the most beautiful shimmering light reflecting off the oil in the pan. I froze, picked up my camera and took a couple shots of the light. I am absolutely in love this photo. Cut the potatoes in half lengthwise, then in half again, into little wedges. Dump them into a zip top bag with enough olive oil to coat and add the rosemary, salt and pepper. Close the bag and shake until potatoes are coated evenly with oil and spices. Dump onto an ungreased cookie sheet and spread out in a single layer. Bake in the center of the oven for 35-45 minutes or until the tops are crispy and browned and the centers are soft when poked with a sharp knife. Sprinkle with salt, if needed, and eat with lots of ketchup. 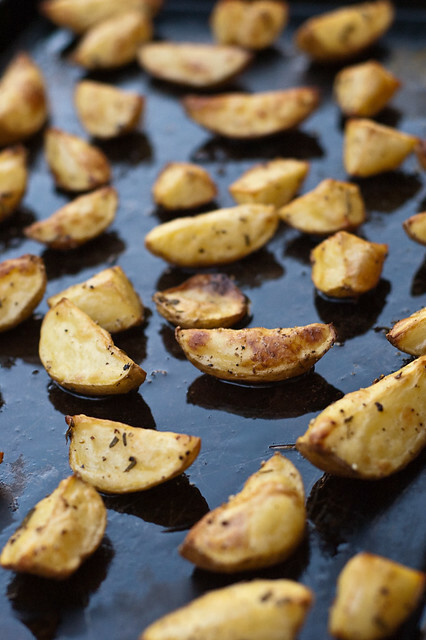 The best trick for making wedges that don’t stick to the pan: arrange wedges with skin side down. It takes a bit longer, but saves heartache later. Especially when you’re hungry and growling and scraping potato off the sheet! You’re making me hungry, which is more evidence that your picture turned out great!